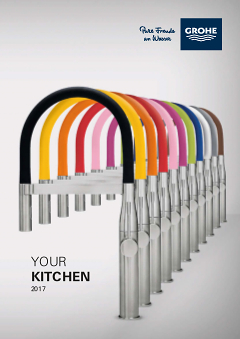 With its many convenient features, this kitchen tap will boost your creativity as a chef. Allowing you to switch between a fine spray jet and a powerful shower jet, its pull-down comfort spray head is ideal for rinsing fruit or vegetables and washing dishes. With a high spout that swivels in a 360° radius, it gives you all the flexibility you need when cooking or cleaning kitchen utensils. Thanks to our SpeedClean anti-lime system, the tap is super easy to clean. Crafted in the trusted GROHE quality, this sink mixer also features our time-saving easy installation system and the GROHE SilkMove technology for a smooth control of water volume and temperature. To make it perfect, it comes with the lustrous GROHE StarLight chrome finish.